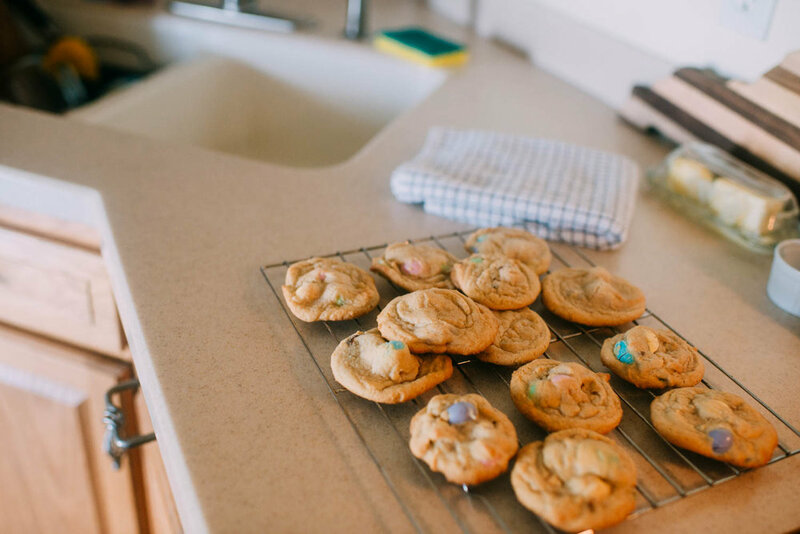 Baking + holidays are my JAM, so with Easter soon approaching, you know I've been all over Pinterest. I figured someone had a great Easter or spring themed recipe and sure enough, I found one. On our first day back to 'normal,' (aka Dad went back to work!) the kids and I spent a long time at the park with our pups and the only way I happily got them to leave was by saying, "Well let's go make cookies!!" These kids LOVE to help in the kitchen. I measured out the ingredients and then same as they always do, turns were taken pouring into the mixing bowl, turning on the standing mixer, and finally the best part [duh]: licking the spatula and beater. Yummmm! These are SO soft and chewy, so don't miss the cornstarch part because it really helps! Use a 2-inch cookie scoop, and make heaping mounds. Preheat oven to 350F, line a baking sheet with parchment, or spray with cooking spray. Place them on the baking sheet, spaced at least 2 inches apart. I baked mine for eight minutes total. Allow cookies to cool on the baking sheet for a few minutes before transferring to a rack to finish cooling.